There have been numerous requests for detailed rules, which are now posted on this thread below! We have also just submitted Version 1.2 to Apple for review, and in that version these more detailed rules are included in the game itself. If you have any questions about Wizard Hex’s gameplay or rules, please post them within this thread where we will promptly respond. Thank you bunches for giving our game a whirl and please remember that while this is a detailed rules set, the basic play of the game is quite simple and after only a few quick plays becomes quite intuitive. It is our intention to provide a more detailed rules set shortly within the game itself. When the board is filled, or there are no more moves that can be made by anyone, the Wizard who controls the most space with their primary element on the board wins the game! If there is a tie, your allies’ controlled board space counts toward your total. If you can eliminate your opponent(s) from the board before the board is filled, you also win. Choose your Element: Select your primary element to play. You use this element to win the game by controlling more board space than anyone else! During the game, you play both your primary element and your allies on either side of your primary element. TIP: No element may attack an adjacent element next to itself as seated around the board. 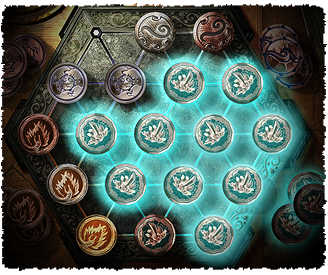 In certain board configurations, your opponent may be able to play one or more of the same elements as yourself (see Board Configurations below). Determine Opponents: Use the small scrolls at each Wizard’s starting position to choose if you wish to engage a Wizard (human shape) or a mechanized opponent (gears) to play that element in the game. If the scroll is closed, then that board position is not being used. You may play with any combination of Wizards (human or mechanized) — from 1-6 opponents. Select a Wizard Level: There are three Wizard levels of play: Apprentice / Journeyman / Master. The higher the level, the fewer the tokens that are available to use during play. Across Challenge: Wizards sit opposite each other in this game. This means that between both Wizards’ primary elements and allies, all the elements are in-play and no Wizard shares an element. Asymmetric Challenge: Wizards sit one element apart from each other with the shared ally in-between! In this game, five of the elements are being used and the one furthest from both Wizards’ elements is left out. Adjacent Challenge: Wizards sit adjacent to each other and here\'s the twist — since your opponent’s Wizard also is an ally (adjacent element), either Wizard may play the other’s primary element, but they may not attack each other directly, because they are allies. However, each Wizard has a separate ally that can be used to attack. In this game, only four of the elements would be used. Controlling Your Elements: You may only move your primary element and your allies that are on either side (which may include some of the same elements or allies as your opponents). How The Board Helps You: On your turn, your side of the board lights up and your own element’s tokens, plus your allies’ tokens on either side, glow magically, showing that they can be moved onto the board. When you touch your element’s tokens or your allies’ tokens, the jeweled spaces on the board where you are allowed to move also glow. The same is true when you can attack — your available element or ally tokens glow, and when you touch one of those token, any adjacent element tokens that may be attacked glow. 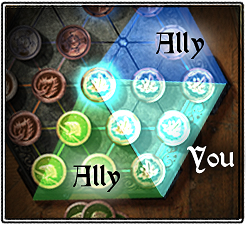 How The Turn Sequence Works: For the first turn only, each Wizard has one move to place their primary element or ally onto the board from their three available token stacks (one primary element and two allies). When you touch the token stack the jeweled board spaces will glow where a token is allowed to be moved (only one of three starting spaces at first). For each subsequent turn, each Wizard has two moves in which they may in any order, with any element, in any combination, do the following: Expand. Stack. Attack. Expand Your Element: You may expand your position on the board by placing your primary element or ally on any open space, as long as: A) It is at one of the three starting positions next to your side of the board; or B) It is adjacent to another element token of the same type that you have already placed. Be careful not to have your three starting positions blocked by an opponent — or even by your own allies by mistake — because they are the only three spaces that your elements can start onto the board. 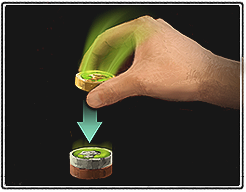 Stacking Your Elements: You may stack a new token from your token stack onto an element of the same type already on the board to increase its power. This magical effect — “transmutes” your Bronze element into Silver; and from Silver into Gold if you stack a third token on top. You may only stack an element to Gold. Once an element reaches the Gold level, it is indestructible and cannot be attacked. However, it can still attack other elements that are not yet Gold. [list]Tokens Equal Level: (Bronze vs. Bronze or Silver vs. Silver) — Both are eliminated. One Level Apart: (Silver vs. Bronze or Gold vs. Silver) — Weaker is eliminated & stronger is reduced to Bronze. You must make a move it if is available (your turn will automatically skip if there is not a legal move). Play continues until all the board spaces are completely filled. At that point, the game ends immediately and the Wizard whose primary element controls the most board space wins! Tie games are determined by counting both your primary element’s & allies’ controlled board spaces. The game also ends if you completely remove your opponent’s primary element from the board. Until a player enters the board with their primary element, they are still in play. Only once they have entered the board and have been eliminated, have they lost. TIPS: In multi-Wizard games, you might kill an opponent by eliminating all of their primary element tokens. However, the game will continue as long any other Wizards are still active. Wizards still in play may be able to “bring back” the eliminated Wizard’s element because it is an ally but that Wizard’s turn shall be skipped throughout the remainder of the game until the game ends either by the board being filled or when there is only one Wizard left. Additionally, as the board fills, keep a strategic eye out for moves that you or your opponent may be forced to make. Try to create such forced moves and avoid them yourself. I just want to start off by saying you guys have developed a fantastic idea/game. I just recently picked it up on my iPhone 4 and I must say, I am hooked. Please please please, when the update comes to add functionality and twists, if you will, to the game - add an option to play the base game OR the advanced? A classic mode perhaps? Why aren’t these rules included with the game? I have just read several reviews for Wizard Hex and they all share one complaint - there are simply not enough rules and strategy guidance included in the app. And no tutorial. Customers shouldn’t have to come to this website to find out how to play! It is this lack of instruction that is putting me off buying the game. I will hold off to see if future updates will rectify this glaring oversight. We definitely plan to put them into the game! Our original reason for not having the longer version in is that we knew we had a lot to fit into a small space — especially with the iPhone/iPod Touch version. We have thought of good ways to add a “help” section that has scrolling rules, and that is likely to be the way we’ll add this level of detail into the game! Adding (coding) takes time, especially for such a small team, so it may be a few weeks before you see the rules update come into the game as it is! In the mean time, please let us know what you think — especially once you’ve played it with friends or family in-person! That’s the way we know it can be enjoyed the most. Why aren\'t these rules included with the game? 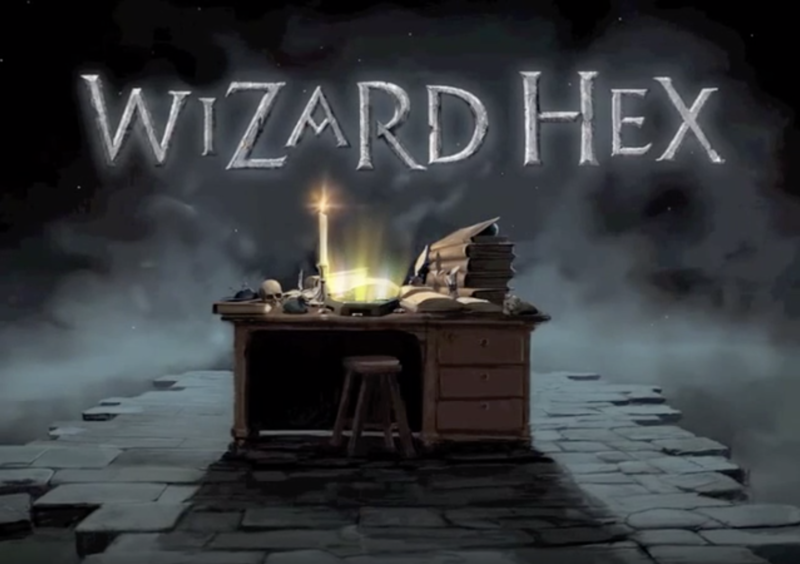 I have just read several reviews for Wizard Hex and they all share one complaint - there are simply not enough rules and strategy guidance included in the app. And no tutorial. Customers shouldn’t have to come to this website to find out how to play! It is this lack of instruction that is putting me off buying the game. I will hold off to see if future updates will rectify this glaring oversight. Saying you’re not going to buy a game because it is missing a rules page ON A PAGE OUTLINING THE RULES is about the most pedantic and immature a thing I could imagine. I agree that after installing the game and trying to find the rules in-game I was a bit disappointed but the description on itunes has the link to these forums and it doesn\'t take a rocket scientist to find them in this thread. The game does need a tutorial and proper in-game rules but their absence, while justification for a lower rating/review is no reason to not try it out. I suspect this is misleading. Allies can be placed on any of that allies' starting spaces, not your starting spaces, correct? or B) It is adjacent to another element token of the same type that you have already placed. Presumably if an ally is shared, you can place next to a token of the same type that the opponent has played? If a silver attacks a bronze (or gold vs silver), it is demoted to bronze. Where does the bronze end up - starting space, or the space that was being attacked? Can a bronze attack a silver, or is it only a stronger piece that can attack a weaker piece?